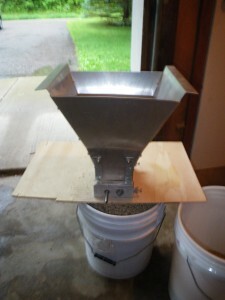 Looking at the forecast for Saturday, May 26, 2012, I thought it looked like a good day to brew. 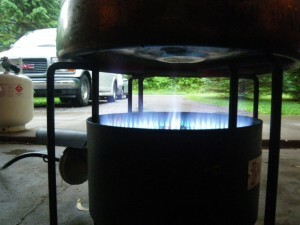 Thunderstorms, windy and cloudy weather seems like the perfect time to play with fire & propane, right? Right. That’s what I thought. The brew day was somewhat spur-of-the-moment. I’ve been drooling about recreating my imperial California Common, and also making another Kolsch. But I didn’t have those yeasts on hand, so I decided on a porter. Dark beers are a favorite of my father-in-law, and I love ’em too. Since it was Memorial Day weekend and he’s a Veteran, I brewed the porter in honor of his service. Fermentation temperature approximately 68 degrees Fahrenheit. I was focused on using ingredients I had on hand, so I couldn’t make any of the recipes I found online or in my brewing books. I took a little inspiration from several recipes and combined them into this monstrosity. They hydrometer sample tasted pretty good, so I have high hopes. I mashed in with 10 gallons to hold a temperature of 150 degrees Fahrenheit for about an hour. While the grains were mashing, I headed inside and got my fermenter cleaned and sanitized and got my auto-siphone, tubing and airlock soaking in the sanitizer solution. The first runnings had the color and appearance of thin, used motor oil, but clean. They looked thick and nearly opaque, but appeared brilliantly clear. As soon as the first runnings were drained, I fired up the burner to get the boil going. I stirred up the batch sparge and let it sit for 15 minutes and added it to the kettle. The second runnings had the appearance of strong coffee. Jet black, but light could pass through. I wound up with just over 13 gallons going into the brew kettle. As my wort was coming up to boil, clouds rolled up the Chippewa River valley where we live. By the time I reached a boil rain was falling and lightning was flaring close enough to affect the lighting in my garage. It was dark enough for the rest of the brew I needed to use a flashlight to see into the kettle to tell if the boil was still good. My propane tank nearly ran out, but at least it was warm enough to keep it from freezing up. If every brew day this year ends with a rainstorm, it’s going to be a long year. My wife said we may have to invest in a pop-up shelter so I can stay dry without brewing in the garage. When I put in the 10 minute hops, I added my wort chiller to sanitize it and waited for the boil to complete. It took about 15 minutes to drop the temperature from boiling to 68 degrees Fahrenheit. There was much stirring involved to help circulate the wort close to the chiller. I had boiled water earlier, cooled it and used it to rehydrate two packets of Safale S-04 yeast. 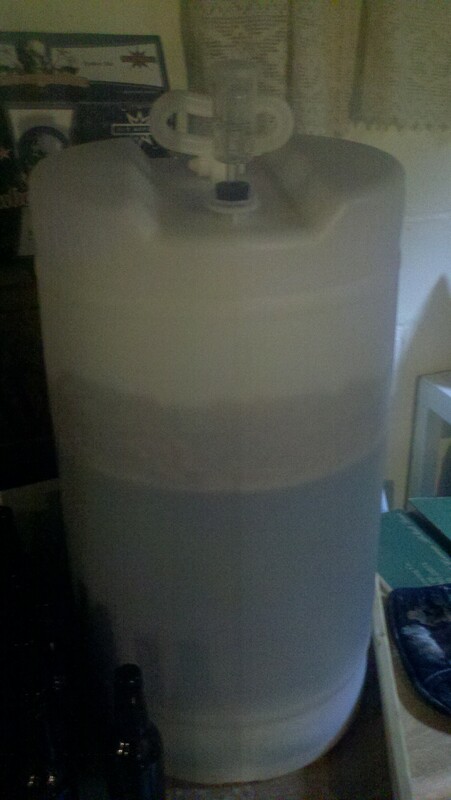 I pitched the yeast into my fermenter and racked the beer on top of it. All I can say is, “I love my half-inch Auto-Siphon. I almost wish I would have broken my old one sooner.” I just got the half-incher before the Big Brew because I broke my original when I was trying to separate the tubing from the cane portion. Siphoning goes so much faster with the half-inch than with the 5/16. Upgrade now. You won’t regret it. I had everything cleaned up by 7PM. By the time I woke up Sunday morning, the yeast was already getting busy. There was a steady stream of bubbles, and by lunchtime there was sanitizer foam coming through the top of the airlock it was bubbling so furiously. Now comes the waiting. My least favorite part. I hope to bottle sometime mid-June, so I should have a fully carbonated report by July. Brew Big or Go Home! Pingback: Patience can be a Virtue - Super Brewers!